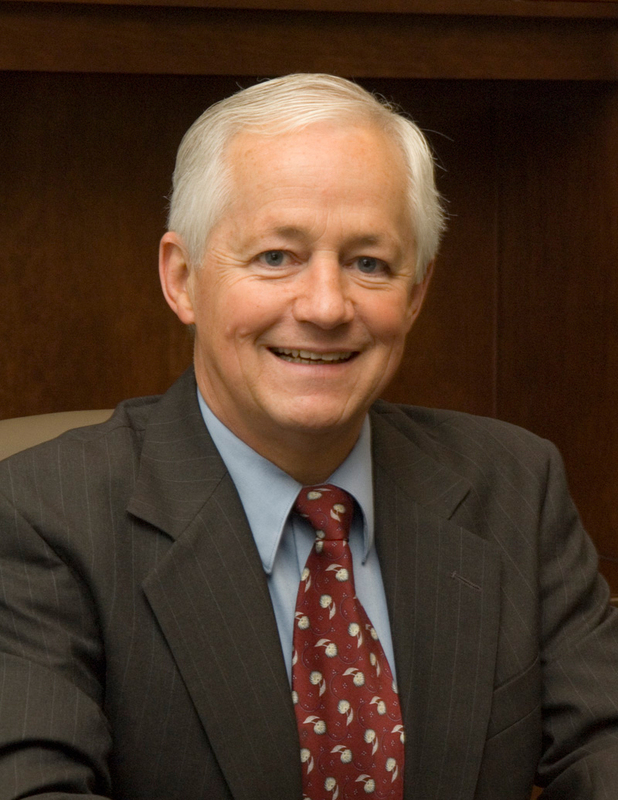 Insurance Commissioner Mike Kreidler has proposed a rule to restrict the sale of short-term limited duration medical plans to three months, prohibit renewal and require enhanced disclosure to consumers about the limitations of coverage. Currently, any insurer that wants to sell a short-term limited duration health plan in Washington state must first receive approval from the Office of the Insurance Commissioner (OIC). The federal rule expanding the duration of these plans to up to one year, with renewals for up to three years, also permits state insurance regulators to set standards for their own health insurance markets. “Some consumers may be caught in a coverage gap and need a short-term medical plan,” Kreidler said. Kreidler’s office determined that although some circumstances exist where these types of plans can fill a coverage gap for consumers, they should not be considered an alternative to comprehensive health insurance. In addition, improved disclosure is needed to make sure that people understand what is not covered by these plans. A public hearing on the proposed rule is scheduled for 1pm, September 26 at the Office of the Insurance Commissioner, 5000 Capitol Blvd. SE, Tumwater, WA 98501. The Washington State Department of Health announced Thursday that portions of commercial shellfish areas around 20 Puget Sound marinas would no longer be classified as prohibited. 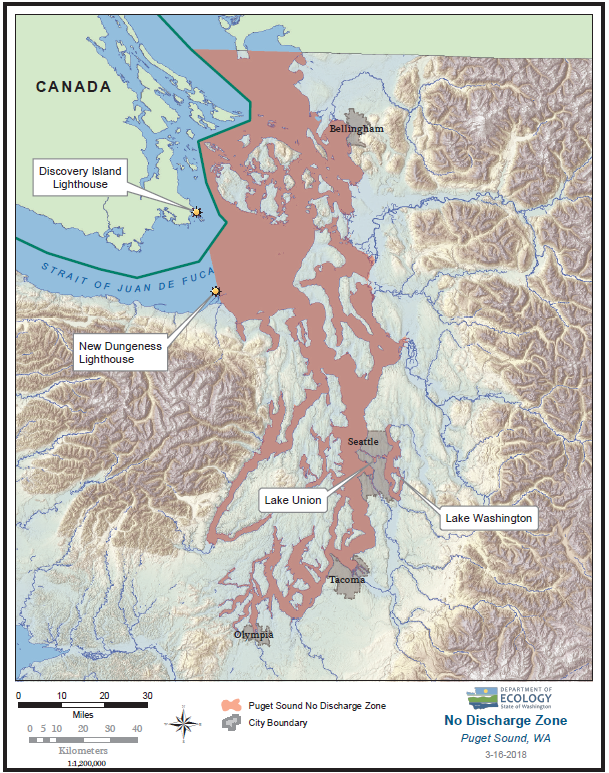 Improved sewage management has allowed DOH to remove shellfish harvest restrictions on nearly 700 acres of commercial shellfish beds. Over the past 20 years, progress has been made to reduce the potential for sewage discharge from boats and this includes better waste-holding capacity in most boats, increased boat waste pump out stations, and the implementation of a No Discharge Zone throughout the Puget Sound. The improvements have led to better water quality, a lowered illness risk to people who eat shellfish, and greater protection of public health. It was raining the June day I arrived in Seattle in 1950. It rained day after day. I asked a native Seattleite when it stopped raining. She said usually Sea Fair week. Except for that week it rained all summer, with long, hard rains from September to May and mostly grey skies. There were lots of evergreen trees. This pattern continued almost all year around through the 1970s. After that there were more sunny days, but still rain. In the 1980s it seemed there were lots more sunny days and less rain. 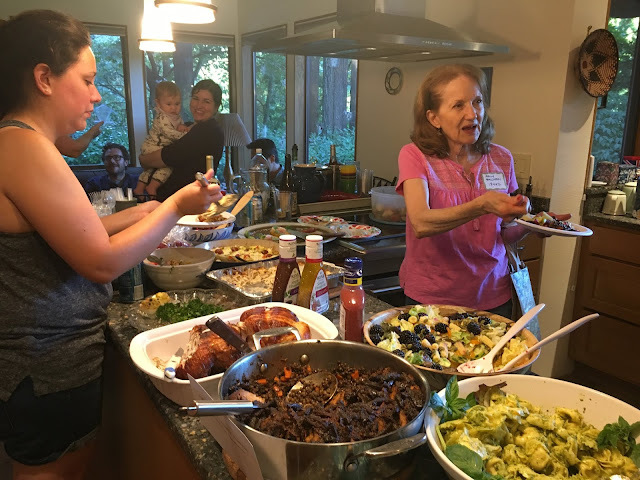 When I moved into my Shoreline house in the late 1990s it was still raining sometimes during the summer which made growing fruit trees, veggies and berries easy. But now there are fewer trees since many homeowners removed evergreen trees on their lots. This year, 2018, the temperature in my back yard was 100 degrees for almost an entire week with high 80's and 90's temperatures day after day - very different from earlier years. Climate change has occurred, although a recent Gallup polls reports that 47% of Americans do not think believe that. The consequences will affect all of us. It is projected that we will have a warmer drier winter this year. That means a lower snow-pack and less water for the people flooding into this area. Dirty stagnant air makes breathing lethal. 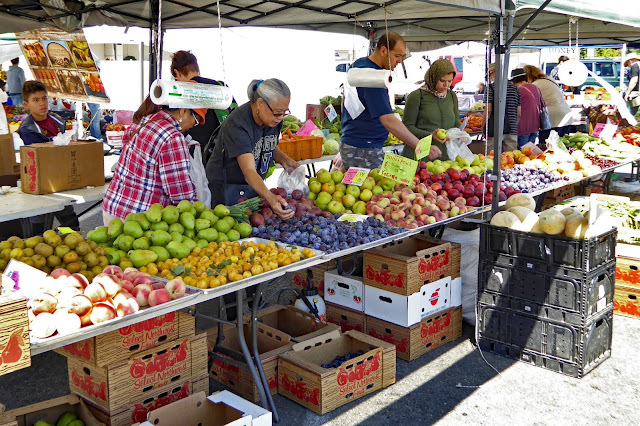 Costs of producing all kinds of food are increasing. Global warming is a direct consequence of our human addiction to fossil fuels and our standard of living. We have a choice. Change our life style or our life span will decrease with much higher mortality rates. No one will escape these consequences because we are destroying the Commons – the air, land and waters of this planet. 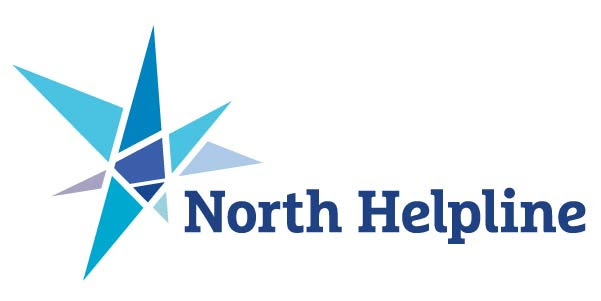 North Helpline food bank is in need of weekday volunteers, starting next week. With summer coming to a close many of our amazing student volunteers will be going back to school. We are sad to see them go, and are needing to fill the empty spots they left for this coming September. They are also in need of regular grocery rescue volunteers on Tuesday and Wednesday morning. North Helpline has two locations: Lake City and Bitter Lake. 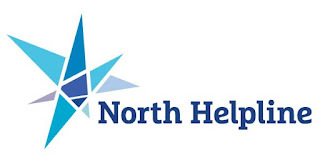 Email Mary Claire at Volunteers@NorthHelpline.org, if you have never volunteered with North Helpline. 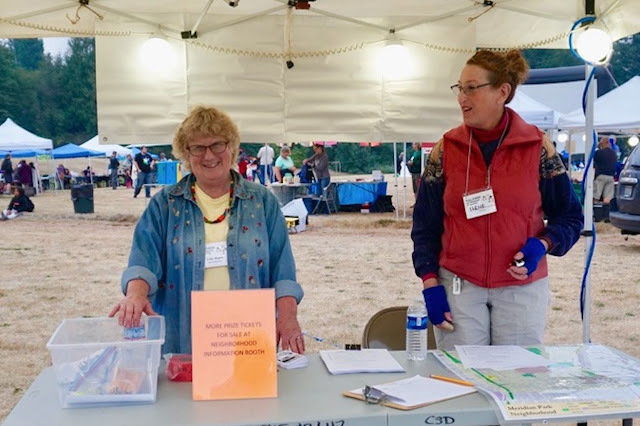 Their volunteer application can be found here. 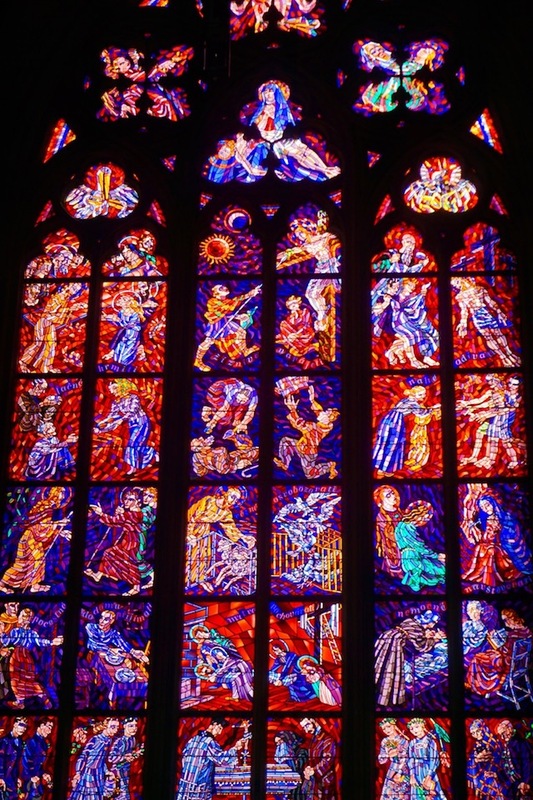 Lee Lageschulte captured this stained glass window at the Cathedral in Prague during a European trip in 2017. Live music every Friday and Saturday at Third Place Commons on the upper level of Town Center in Lake Forest Park, intersection of Bothell and Ballinger Way NE. Performances start at 7:30pm on the stage and usually run until 9:30pm. Dancing is welcome. The music is free, thanks to sponsorship by mall owners Merlone Geier. There are two restaurants in The Commons and four more in different parts of Town Center. 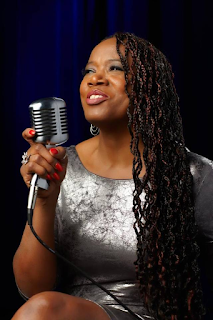 This Friday, August 31, 2018 jazz singer Eugenie Jones is the performer. 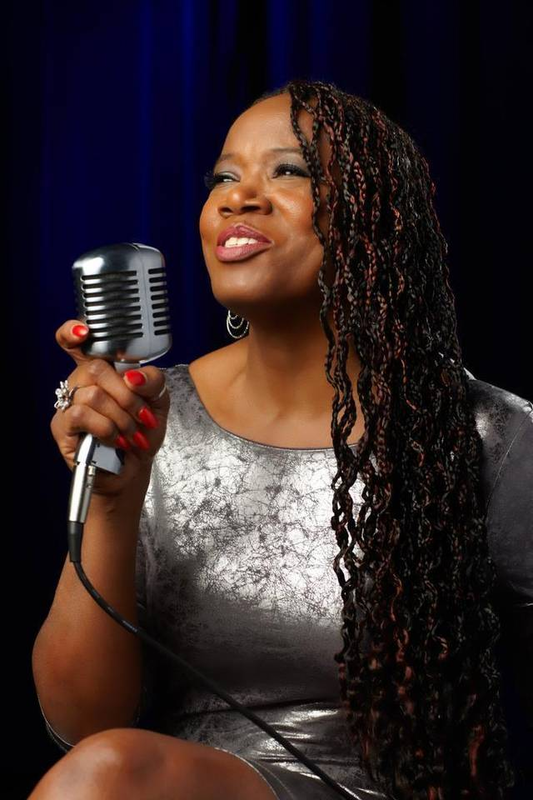 Reminiscent of style and sophistication of iconic vocalists of the past, Jones sings and scats her way vivaciously through mainstream jazz and draws listeners inside contemporary story lines, sharing original tunes that have earned her recognition as a cleverly gifted lyricist. On Saturday, September 1, 2018 Swingin' in the Rain plays Classic swing, waltz, and Latin featuring the sultry vocals of jazz vocalist Dina Blade. 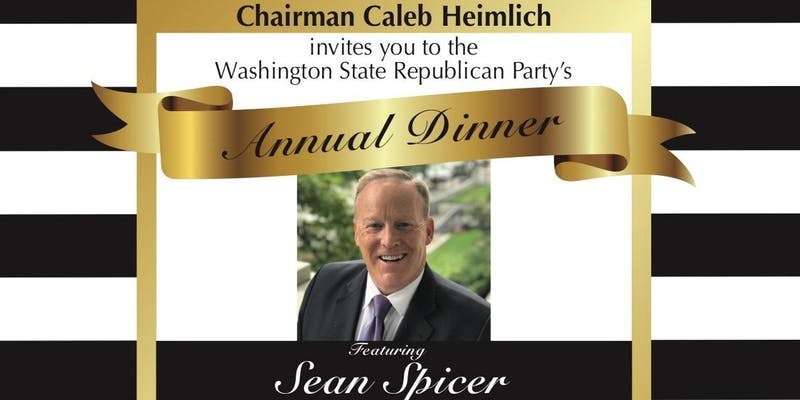 Join Washington State Republican Party Chairman Caleb Heimlich at this year's Annual Dinner on Wednesday, September 12, 2018 in Bellevue. Sean Spicer, former White House Press Secretary, will be the featured speaker to give an insider's perspective on his new book "The Briefing: Politics, The Press, and The President." Tickets are going fast, so register now. With a VIP Admission ticket, you will receive a signed copy of Sean’s book, “The Briefing: Politics, The Press, and The President” and you’ll even have the opportunity to meet him and have your picture taken! Cocktail attire recommended. 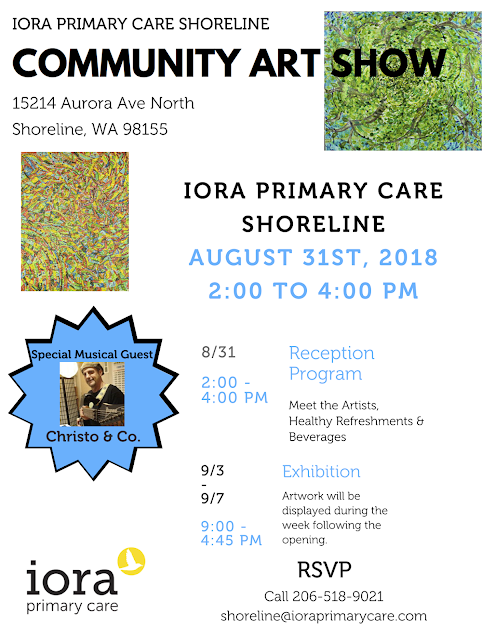 If you have additional questions, call 425-460-0570. The Seattle Times carried a story Thursday about the Trans-Mountain pipeline being halted because the project did not consider the effect of increased tanker traffic on the resident orca population or address the concerns of the First Nations people. Approval for the expansion was revoked by a federal court in Canada, which ruled Thursday that the effects of the pipeline on orca whales were not addressed and the concerns of First Nations were not adequately considered. The Federal Court of Appeals is requiring the government to redo its consultation with First Nations and assess the impacts of the project on the whales. The King County Sheriff’s Office has identified the three Deputies involved in the fatal shooting in Shoreline near the 19000 block of 16th Ave NE on August 23, 2018. Deputy George Alvarez (20 year veteran assigned to SE Patrol), Deputy Jesse Herrera (18 year veteran assigned to the range as the department taser coordinator) and Deputy Steve Shalloway (6 year veteran assigned to Metro Transit patrol). All three Deputies are also members of the TAC-30 SWAT Team. The TAC-30 SWAT Team is a special unit of the Sheriff's office, specially trained for high risk situations. On August 23, KCSO’s TAC-30 SWAT Team was serving a high risk search warrant for a house in Shoreline where drug activity was suspected. Just after making entry into the home, police were confronted by a male suspect in a bedroom. The suspect armed himself with a handgun which he refused to drop when ordered. Instead the suspect moved the handgun towards the TAC-30 members. Three Deputies fired, hitting him multiple time. The King County Medical Examiner identified the victim as 55-year-old Joseph William Peppan and stated that cause of death was multiple gunshot wounds. Deputies Alvarez, Herrera and Shalloway remain on paid administrative leave during the investigation, which is standard procedure for an Officer involved shooting. 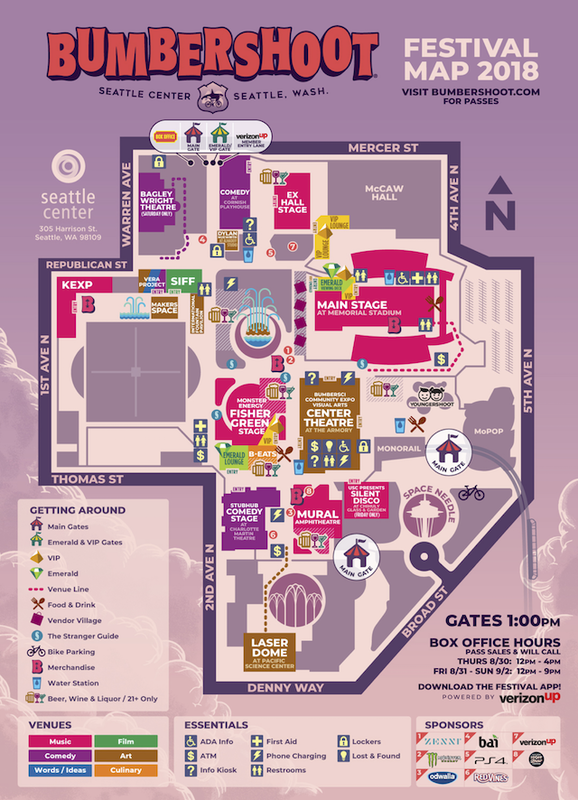 Labor Day weekend in Seattle means Bumbershoot - the huge 3 day arts festival at Seattle Center. Three days of music, film, comedy, art, food, poetry. It starts on Friday at 1pm and the music goes until 11pm. Same for Saturday and for Sunday. Now approaching half a century, Bumbershoot is one of Seattle's largest cultural touchstones. Each year, thousands of people from across the country flock to Seattle Center to attend this acclaimed festival, which has become one of the biggest and most-loved contemporary festivals in North America, while having maintained its Northwest spirit and innovative roots. The name Bumbershoot was chosen both as a knowing nod of respect to our city’s most famous weather pattern, and a symbol of the overarching mission of this festival: to be an umbrella for all of the arts. 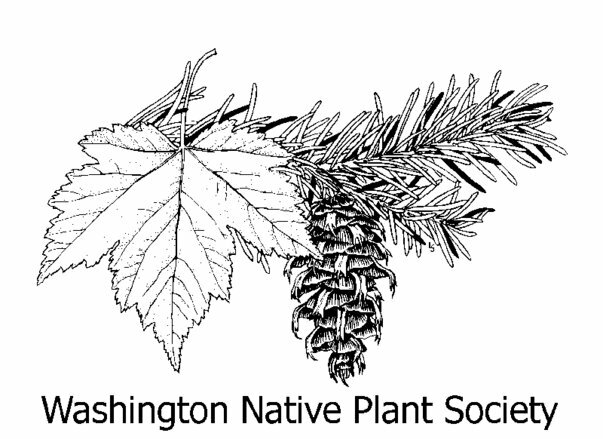 Its seeds were planted in 1971 with Festival 71 -- the brainchild of then Seattle Mayor Wes Uhlman. The next year Bumbershoot was born: a multi-disciplinary arts festival showcasing the best of comedy, dance, film, literary arts, music, performing arts, theatre, visual arts and more. Spanning the Seattle Center grounds, a campus originally created for the 1962 World’s Fair, Bumbershoot has continued its legacy of celebrating innovation and the search for what’s next. All the information and ticket sales are on the Bumbershoot webpage. Rhys Kroehler, 19, is a finalist in his age group for the Intellectual Property Owners Education Foundation (IPOEF) 2018 Video Contest. 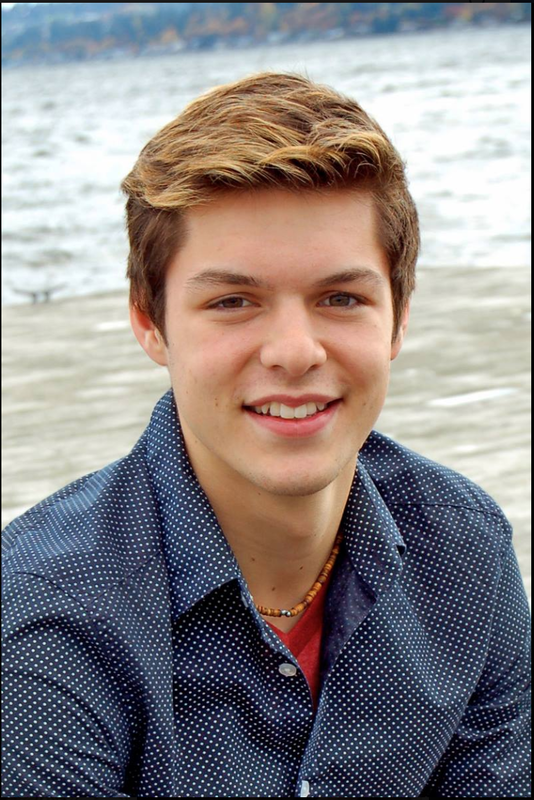 Kroehler, a 2017 graduate of Shorecrest High School, found out about the competition through a scholarship notification web site. “The $7500 scholarship prize goes to the film that gets the most online votes by today’s deadline (August 31, 2018). “The prize money would help me continue my education at the University of Southern California's School of Cinematic Arts as a Film and Television Production major,” Kroehler said. He is currently enrolled at the school as a sophomore and is on track to graduate in 2021. The goal of the competition is to create a 60 second video that “teaches the world something interesting about patents, trademarks, or copyrights’, according to IPOEF. Kroehler said he has been interested in filmmaking since he was 10 when he received a stop motion camera that he used to make short films using Legos®. Raised in Shoreline, his parents are both creative people. His dad, an artist, and his mother, a writer and graphic designer, taught him at an early age that all art has a story to tell. “I realized the power of filmmaking when I showed a short I’d done in my sophomore year to my mom and she cried halfway through” he said. 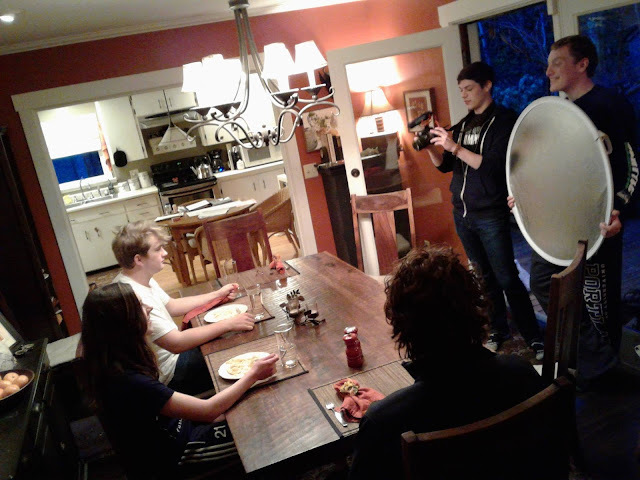 That experience taught him that film is more than 24 pictures per second flashing by in a second. It establishes a connection between the people behind the screen and those in front of the screen watching it. While still in high school, Kroehler built houses in Mexico three summers in a row. While there, his interest in learning about people’s stories deepened and it gave him more insight into how powerful story telling can be. He is fascinated by what leads people to take certain paths in their life. “There is so much animosity between people who are different because we don’t know them. We all go through similar struggles,” he said. According to him, the best way to get to know someone else is to share stories with them. While his primary goal is to entertain, he believes that it’s also important to make the world better. 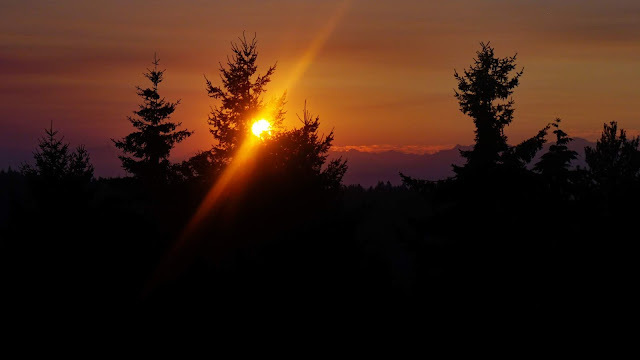 Finally - local scenic photos where you can see something besides wildfire smoke! Look! 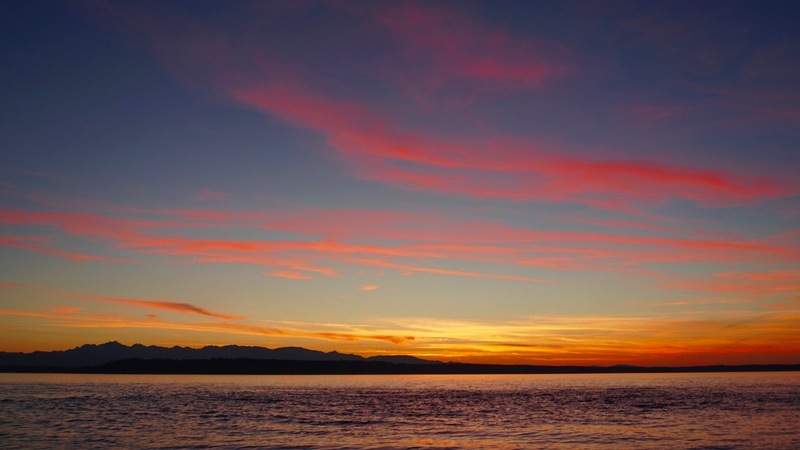 Water, sky, mountains, pink wispy clouds - oh how we have missed you! Iora Primary Care's annual community art show begins Friday, August 31, 2018 with an artist reception from 2 - 4pm. The exhibition will run through September 7. King County Elections wins award for media campaign "Why Vote"
The Election Center, a nonprofit organization dedicated to promoting, preserving and improving democracy, announced winners for its annual professional practices awards. King County Elections took home the "Democracy Award for Best Practice" for their 2017 media campaign,"Why Vote." 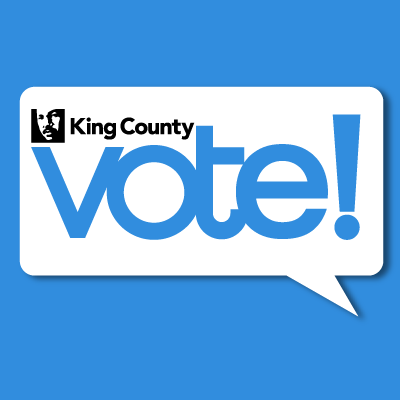 The campaign sought to further King County Election's mission to make voting easy and accessible to all, regardless of ethnicity or income level. It featured two videos, the "Multiplier Effect," an animated spot designed to illustrate the importance of voting, and "The Struggle," a more somber depiction of the hard fought battle for voting rights in this country. "We wanted to send the message that your vote matters and you shouldn't take it for granted," said Director of Elections, Julie Wise. "And with all the noise out there right now, we knew we needed to do something fresh and even a little provocative." The full professional practice paper, as well as information about how to register and vote, can be found on the King County Elections website. Construction on the new Einstein Middle School began this Summer 2018 with an anticipated completion date of August 2020. The new 150,888 square foot school will have the capacity for 1,071 students and will house 6th - 7th - 8th grades instead of the current 7th-8th grade configuration. The reality for the kids will be the teachers and the classrooms, not the construction going on outside. Staff and teachers were there to meet the buses as they pulled up. Here, a student is greeted and shown where he is supposed to go to start his day. Students met their teachers at an all-school assembly in the gym. There was not quite enough room to seat all the students, so they spilled over onto the floor. And the teachers! They are leading the kids in a silly song - everyone's arms are in the air and the ice is definitely broken. The upperclassmen - 8th graders - had skits and routines to greet the "sevies". Middle school represents a lot of change for kids. Different teachers for different subjects. Moving from classroom to classroom during the day. Lockers. Going from being the oldest kids in the school to being the youngest. Having classmates a foot taller (or shorter) than they are. Welcoming activities help ease the transition. 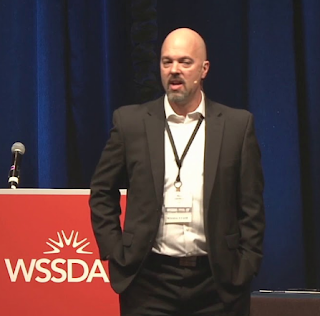 Since 2016, Tim Garchow has served as the eighth person to lead WSSDA during its 60-year history as a state agency. He has experience as a teacher, principal and superintendent. 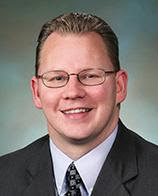 Ever since the gavel struck to close the 2018 legislative session, educators, administrators and organizations like WSSDA have been continuously working to assess the impact and implications of the Legislature’s response to the McCleary decision. As we look across the state, it is evident that one of the impacts is an unprecedented amount of collective bargaining. 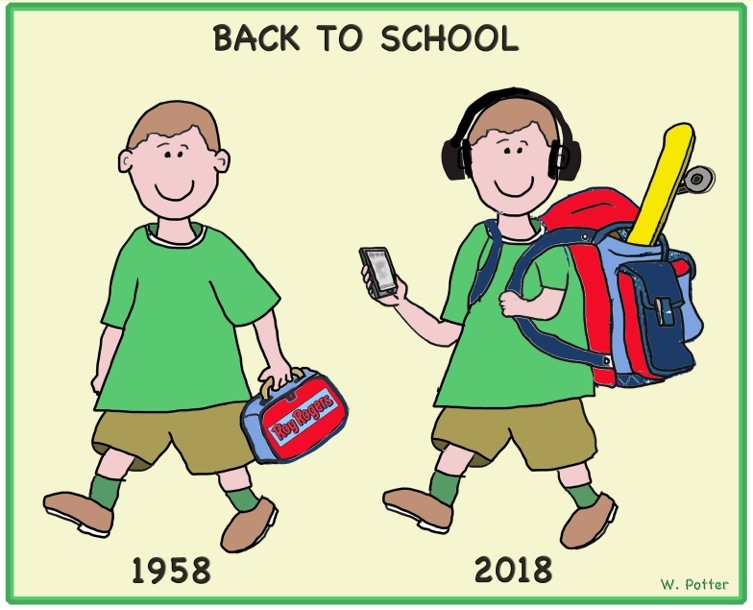 I’m sure both sides of the table would rather be focused on back-to-school preparations because the children are why all of us work in education, to begin with. Because of our shared focus on students, I’m confident that all parties involved will continue to bargain in good faith, and that agreements will be reached that respect the professional dedication of all school district employees while ensuring the continued solvency of our school districts. While that is happening, there are three things that must be taken into account. First, the amount of money that districts have to bargain with is not the same. School districts will not receive the same amount of funding for the same amount of teachers. This means that one district’s ability to provide a salary increase may be dramatically less than another district located right next door. That’s why comparing one district to another can be like comparing apples to oranges. While all school districts are set to receive a standard amount of funding per teacher, some districts are set to receive additional funding based on the new formula set up by the Legislature. Within that formula, there are a variety of factors causing a variation in funding available to districts, but one, in particular, is something referred to as the “regionalization factor,” which is intended to provide more funding to districts with higher housing costs. Because of regionalization, the amount of money districts receive for teacher salary can vary by up to 24%. Thus, we are seeing confusion at the local level when some districts are able to provide larger salary increases than others. Second, state funding is set to increase, but local funding is set to decrease. Over a third of Washington’s school districts are going to lose 50% or more of their local levy funding. In many cases, districts and communities have prioritized these levy funds to provide enrichment programs for students or to meet other objectives of their strategic plan. Timing is also an issue. New state funding starts at the beginning of this school year. The limitations on local funding don’t occur until later. In many cases, that means an increase in funding now will be followed by a reduction of funding in the near future. This can add to the confusion around how much money districts actually have to bargain with. Third, districts have been working hard to determine what they can afford. To help school districts navigate changes brought about by the new legislation and to ensure sustainability, the Legislature added a requirement for districts to create a four-year budget plan. For months now, districts have been working with the Office of Superintendent of Public Instruction and their Educational Service Districts to determine the level of salary increase that they can afford on a long-term basis. This work has been difficult, complex and ongoing. Each district must continue to make a thorough examination of what they can afford based on their own unique situation, regardless of the agreements being reached in other districts. The important thing to remember in all of this is that teachers, administrators and school boards want the same thing. We want the best possible education for our students. We all appreciate and respect the role that each other plays in making that happen and we realize that none of us could do it alone. We acknowledge the professionalism, expertise, and caring that each other brings to our districts and we will continue to give our all for the 1.1 million students of Washington state. Formed in 1922, WSSDA has grown to include 1,477 locally elected school board directors from across Washington. As a state agency, per chapter 28A.345 RCW, WSSDA supports its members with research-based leadership development resources, policy and legal guidance, and legislative advocacy. This work is of critical importance because school board directors build the future of public education by setting the policy, governance, and budgetary priorities for all of Washington's 295 school districts. 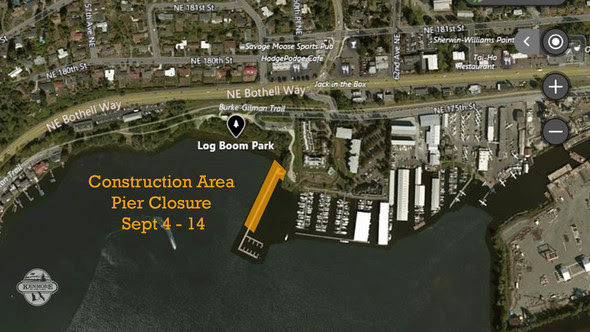 The pier at Log Boom Park, 17415 61st Ave NE, Kenmore, will be temporarily closed for railing replacement from Tuesday, September 4 to Friday, September 14, 2018. Contractors will be replacing guardrail and bull rail along the north end of the pier. Due to safety issues associated with an active construction site, the pier will be closed to the public. Boats coming into the area hoping to access Log Boom Park or Kenmore via this pier will not be able to do so during this time. Additionally, hand-powered watercraft will not be able to use the seasonal docking float during this time either. 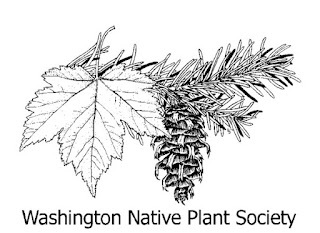 For questions and more information contact Becky Range, Communications Specialist at 425-398-8900. Five outstanding University of Montana alumni will receive 2018 Distinguished Alumni Awards on Friday, October 5, 2018 during Homecoming. The awards are the highest honor presented by the UM Alumni Association. This year’s distinguished alumni are Paul Lewing ’69, M.F.A. ’72, of Shoreline, Washington; William Marcus ’74, of Missoula; Sara Peck ’66, of Lakeside; Sheila Skemp ’67 of Oxford, Mississippi; and Evelyn Adedoja Yeye Dada, M.P.A. ’83, of Abuja, Nigeria. Lewing, who earned his bachelor’s and master’s degrees in art from UM, followed his childhood dream to live as a professional artist in Seattle. 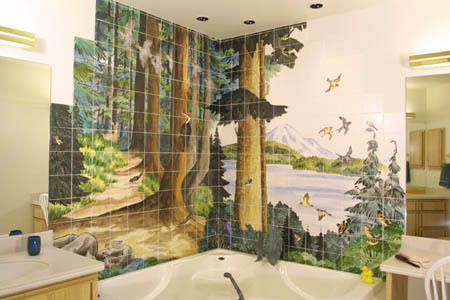 Since 1972, he has worked in pottery and ceramic tile, and he has created more than 1,000 custom projects for clients all over the world, including dignitaries in Sweden and Japan. 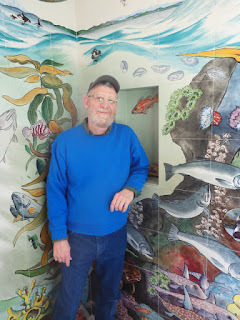 Lewing has written two books on the ancient technique of china painting, and he has painted numerous murals. 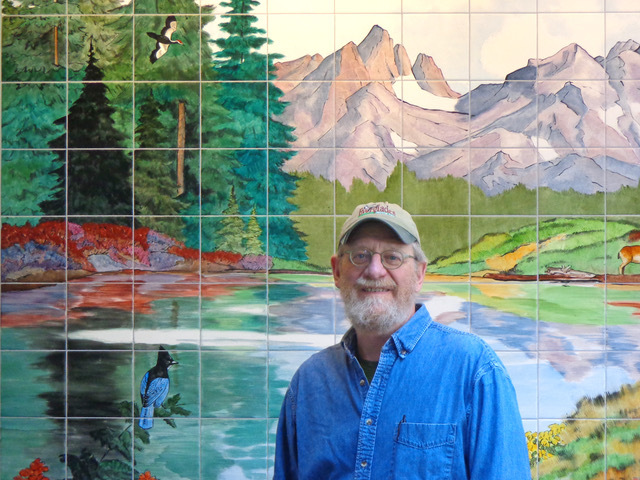 His collections are in institutions from the Seattle Art Museum to the Igneri Talleres Foundation in the Dominican Republic, and some of his works include large tile murals for churches and colorful shower wall tiles with paintings of landscapes. 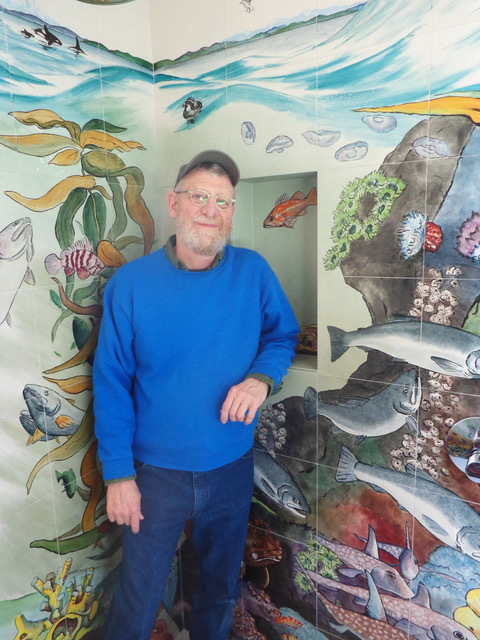 He also has taught art and ceramics to thousands of students, presenting seminars in every U.S. state. Lewing holds studio sales in Shoreline for the holidays and often in summer as well. Shoreline Farmers Market will be at Shoreline Place every Saturday from 10am-3pm, through October 6th. It's on the upper level, near Central Market, entrance off 155th/Westminster Way. I don't know how it happened, but apparently it's September already. While we're still enjoying the beautiful produce of the summer, the season is changing and soon enough we'll be stocking up on squash and root vegetables. We're delighted to have 2 fantastic food trucks with us this week. Nosh returns with their British style fish and chips accompanied by a surprising pea and mint mash. Seoul Bowl is bringing their bold Asian flavors to us in the form of a build your own Korean BBQ bowl. How to choose? Live music every Saturday. Pluck Music will kick off the day at 10am with harmonizing harps. Mike Bush will brig the energy up with his American Classic Rock music at 12:30pm. 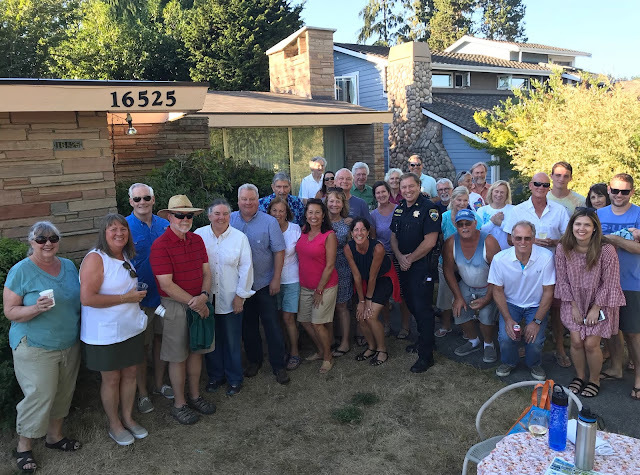 August National Night Out is a favorite for many Lake Forest Park residents with 37 neighborhood get-togethers taking place on Tuesday, August 7, 2018. Ken and Philippa Kassover host National Night Out at their home which sits on old Circle Drive but is now named 47th Ave.
National Night Out host and Lake Forest Park City Council Member Phillippa Kassover chatting with neighbors. New neighbors were warmly welcomed and some apologized for either their loud barking dogs or for building development noise taking place. 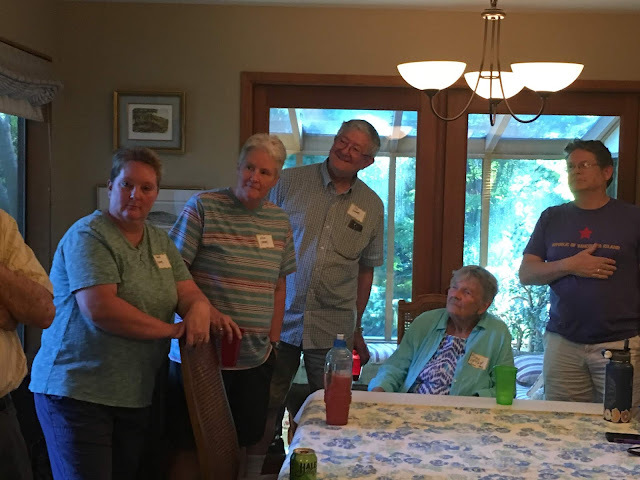 Getting to know something about the people who live on your street is empowering and especially in a time of need or emergency. These neighbors have a list called “Circle Drive Need” just in case of one. Looks like the dog is enjoying the dinner, too. 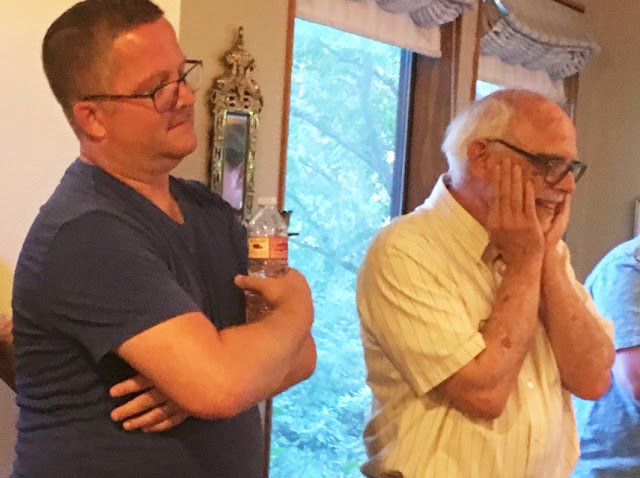 Ken Kassover also reminded his neighbors about Crime Watch which is a service sponsored free by the LFP Police Department. Ken volunteers for Crime Watch and says that vacation house checking can be accessed by any property owner living in the City of LFP. Over 37 National Neighborhood Night Out events were held throughout Lake Forest Park. The police have a call to action. “If you see something, say something, and this will help us to continue to drive down crime in this great City,” says Captain Armbrust. The police have always been an encouraging partner in National Night Out which began in 1984 with neighbors just turning on their porch lights and sitting in front of their houses. 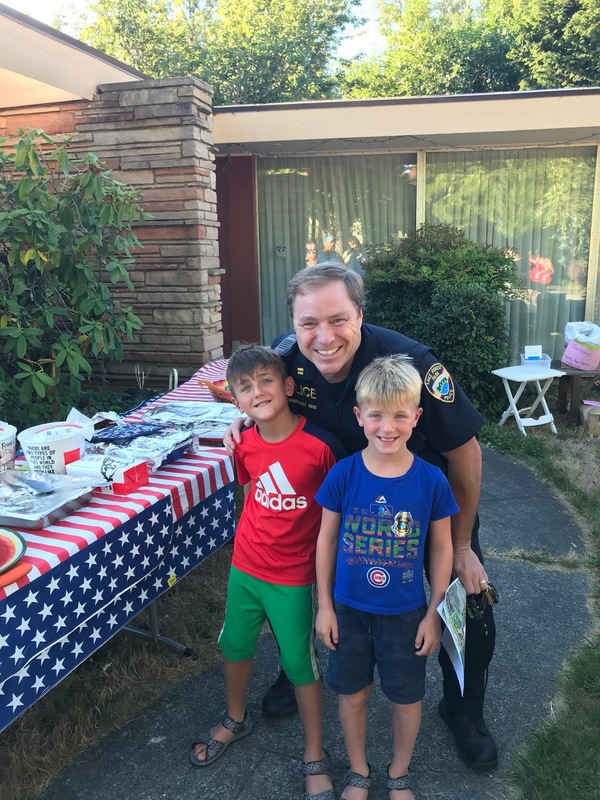 According to the National Night Out website, "The first annual event involved 2.5 million neighbors across 400 communities. Today, 38 million neighbors in 16,000 communities across the nation take part in National Night Out which has transformed into many different types of community gatherings." Information about scheduling a neighborhood Night Out Against Crime in LFP here. 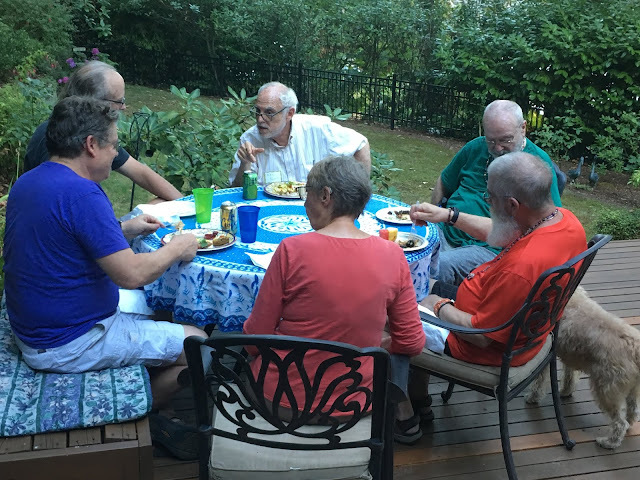 This type of relationship building creates trust between residents and the police as everyone gains better understanding of the community and its needs. 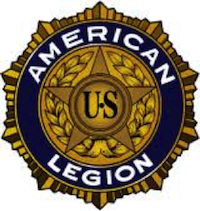 The American Legion Post 227 in Shoreline will hold their monthly meeting on Tuesday evening, September 4, 2018. A meet and greet starts at 6:30pm and the program starts at 7:00pm. The 2018 winner of the Post 227 Life Changer award will be presented with a framed certificate and a $200 gift certificate. Then Daniella Young, CEO of a culture and innovation consulting firm and an expert on team building, will discuss her experiences as a US Army captain serving two years in Afghanistan with honor. Her husband, Chief Warrant officer Tom Young, served eight combat tours as an Army helicopter pilot and survived being shot down in Afghanistan. There will be an opportunity for questions after the presentation. While you are at the meeting, you can check out the Post Library that includes a large collection of militarily related books, video tapes and DVDs. Any of these can be checked out, used and returned by post members and community without charge. Also check out the Post 227 website. Wednesday night the North City Bistro will welcome a new act, with Deepak Ram, along with Marina Albero, Tor Deitrichson, Ravi Albright and Dennis Stawkowski. $10 cover. 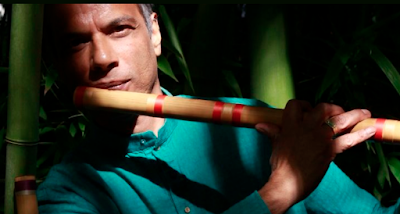 South African bansuri flutist Deepak Ram is a captivating performer and composer, combining technical mastery with personal charm. He has performed in the U.S., South Africa, India, United Kingdom, Ireland, France, Austria, Germany, Lebanon, Turkey and Holland and had the honor of accompanying his teacher, maestro Hariprasad Chaurasia, in Geneva, London and Paris. Deepak's knowledge of both Indian and western traditions is evident in his compositions which range from pieces for jazz groups, western flute quartets (flute, violin, viola and cello), choral works and ballets to orchestral pieces. Deepak earned a Masters degree in Music (MMus) from Rhodes University, South Africa, in 1996 for his thesis, “Exploring Syncretism Between Indian and Western Music Through Composition”. Deepak's versatility is apparent in his numerous collaborations with musicians of various genres. These include performances with jazz pianists Darius Brubeck and Bheki Mseleku, Tunisian oud player and vocalist Dhafer Yousseff and the popular South African band Tananas. On January 1 2000, Deepak performed with South African musicians like Sibongile Khumalo and the Rwandan diva, Cecile, on Robben Island in South Africa's millennium concert hosted by presidents Nelson Mandela and Thabo Mbeki. Thursday, we look forward to a return show by Dan Duval's Good Vibes Quartet, who will play from 7:00-9:30pm for $8 Cover. Lyric Jazz Standards, Melodic Originals, a Touch of Swing, Lots of Latin and a Bit of Blues. Friday, Adriana Giordano returns from some shows in California, for another show with EntreMundos Quarteto. They will be joined by an amazing Brazilian percussionist, Eduardo "Dudu" Fuentes. They will play from 8:00-10:30pm for $15 Cover, and tickets are available until Thursday evening at this link. And Saturday night, a return show by Johnny Pinetree and the Yellin' Degenerates. They will be playing from 8:00-10:30pm for $15 Cover and tickets are available at this link until Friday evening. John Paynich will be joined by Jon Grant on Bass, Bill Ray n Drums, John Tobin on Keys and Brian Monroney on Guitar. In addition to purchasing tickets, call 206-365-4447 or go to the website and fill out the very simple reservation request form, in order to secure seats for the shows. The kitchen opens at 4:30pm and serves a mouthwatering variety of small plates and desserts as well as an extensive wine stock. (Menu here). The North City Bistro is located at 1520 NE 177th Street, Shoreline 98155, phone 206-365-4447. CeCe Ryan has been a Certified Personal Trainer since March 2012 and an Enhance Instructor since October 2015. She is a Certified Health Coach and Older Adult Fitness Specialist. She holds additional certifications in Group X, Silver Sneakers, Chair Chi, Tai Ji Quan: Moving for Better Balance and Life Coaching. Her experience includes three years leading Enhance Fitness for Seniors. Six years teaching/leading Healthy Steps classes for Cancer Lifeline at Valley General and Evergreen Hospitals, Assisted Living and Memory Care retirement communities. 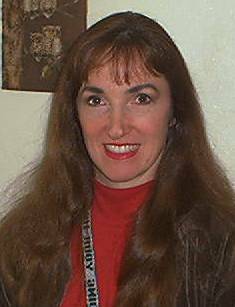 In addition, she has many years of experience in counseling/coaching and administrative roles including non-profit behavioral health services, healthcare clinics and holistic healing seminars. I love teaching proper exercise form and techniques and I really want my clients to feel successful and see how much they can enjoy a healthy lifestyle. I enjoy working with boomers and seniors who might be frustrated but are still motivated to tone up, build strength and endurance and reach all their goals. I have had a lifelong love affair with dance, fitness, nutrition and counseling/coaching and am excited to work with each client to reach their goals. Contact the Senior Center for information about joining these classes. Either call 206-365-1536 or drop in to inquire in person. 18560 1st Ave. NE #1 Shoreline 98155, southernmost building on the Shoreline Center campus. 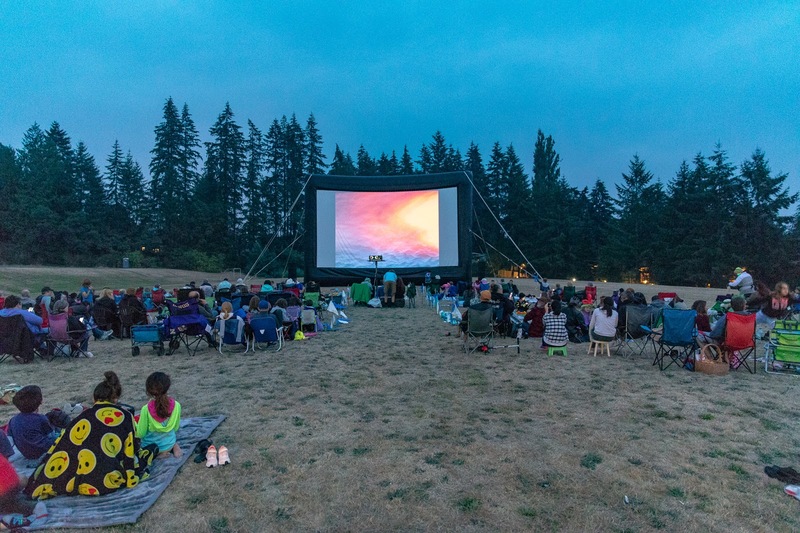 On Saturday, August 25th, Ballinger and Meridian Park neighborhoods came together to enjoy a movie under the stars at the Aldercrest Annex field. 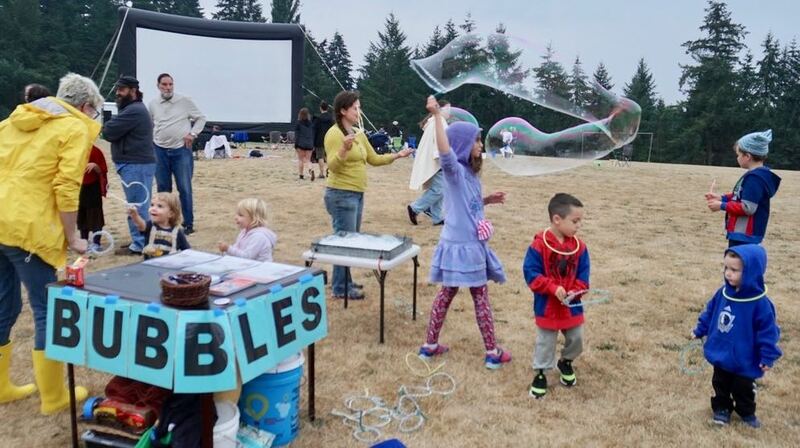 It was the 10th annual Outdoor Movie Night and "The NeverEnding Story" was the movie being shown. 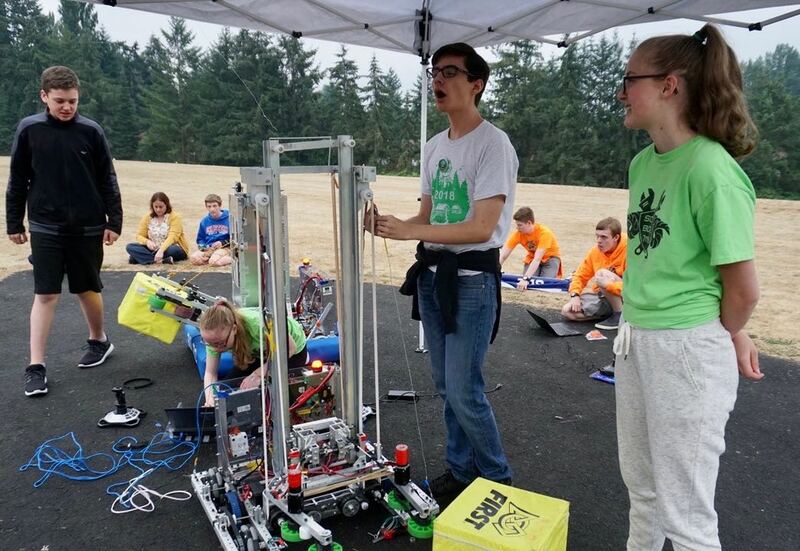 Community members arrived to see the drones from FPV Racing Seattle and Diversity in Drones flying about in their lit race course, while Shorewood and Shorecrest high schools had their robotics team there doing robotics demonstrations. 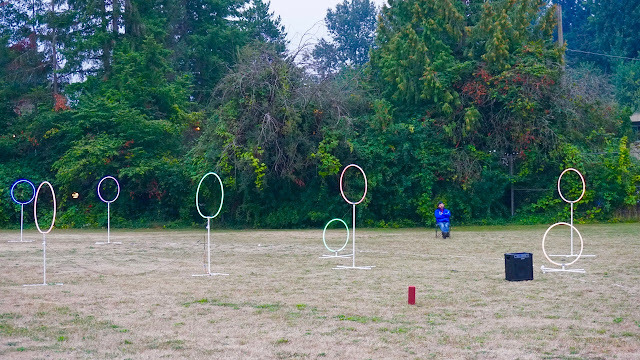 As dusk started to settle in, children and adults were enjoying the many activities provided for them during the pre-movie entertainment. 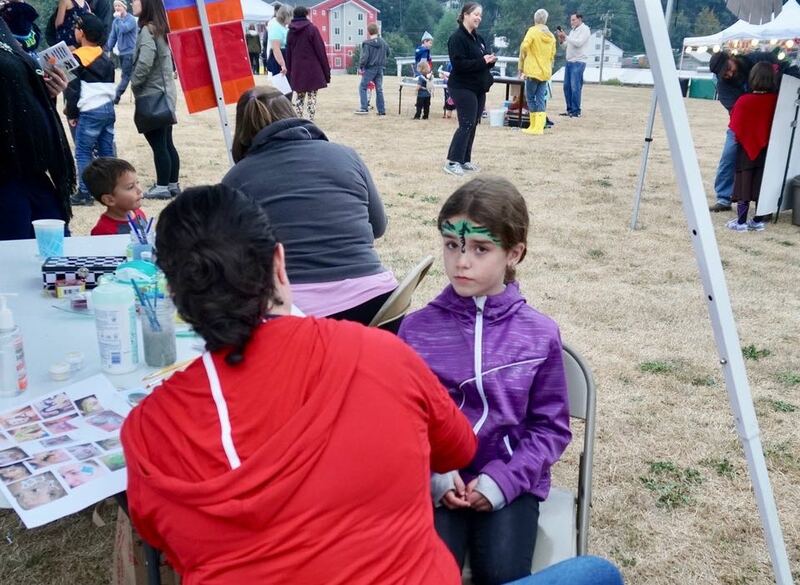 Face painting, balloon animals, a bubble zone, and a multitude of crafts entertained many of the community members while others enjoyed sitting and waiting for the movie to start. 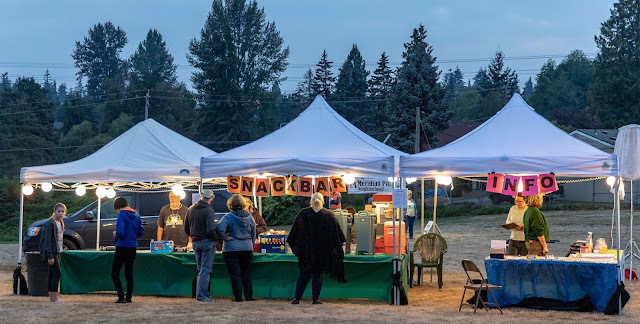 There was a prize drawing for several prizes that were donated by local businesses and community members. 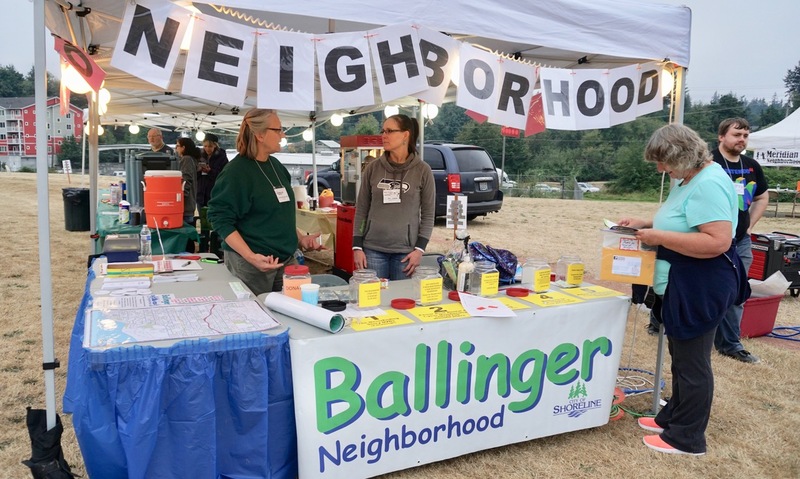 The event was planned and carried out by the Ballinger Neighborhood Association and the Meridian Park Neighborhood Association. 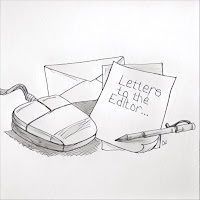 In late April, the Office of Superintendent of Public Instruction (OSPI) opened a survey asking the public to determine how important they found additional public K–12 education investments. In the six weeks the survey was open, more than 30,000 Washingtonians shared their priorities. Participants included educators, parents and families, and community members. Identifying 15 different priorities, the survey asked participants to determine how important they found each one. Student support services, such as counseling, advising, and mental health, was selected as the number one priority. Other highly ranked priorities include access to career and technical education and work-based learning opportunities, school safety enhancements, and effective buildings and facilities for learning. 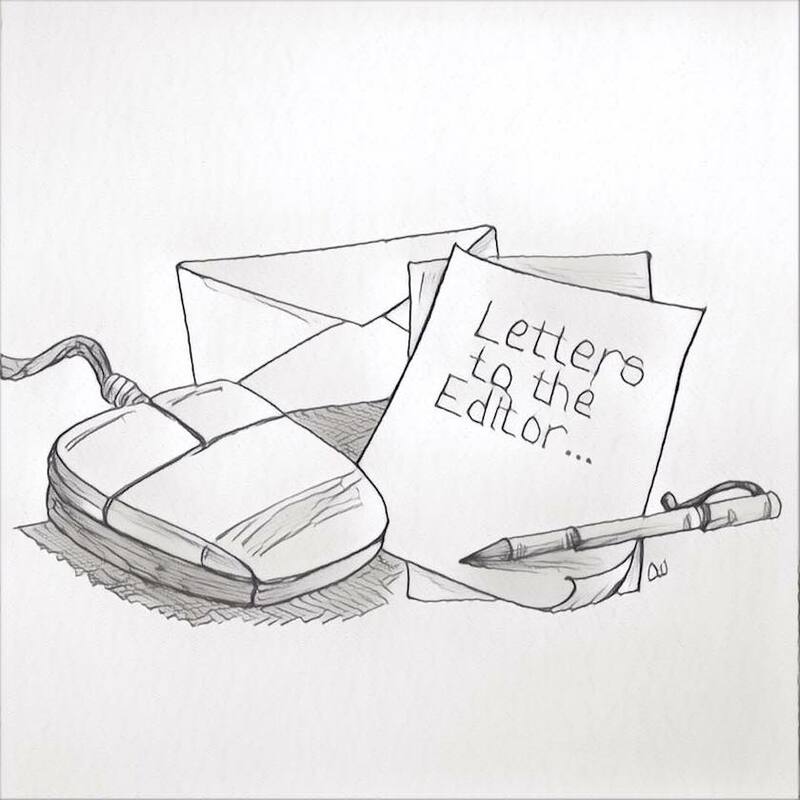 “These results have made it even more clear how important it is for our schools to be able to address the mental health needs of our students,” Reykdal continued. OSPI will use the survey results to shape its budget requests before submitting them to Gov. Jay Inslee in mid-September. Today, OSPI opened a follow-up survey asking participants to determine how much funding they would allocate to the top seven priorities identified in the first survey, given a set amount. The survey is available in English and Spanish and will remain open through September 12, 2018. Translations to other languages are available upon request. 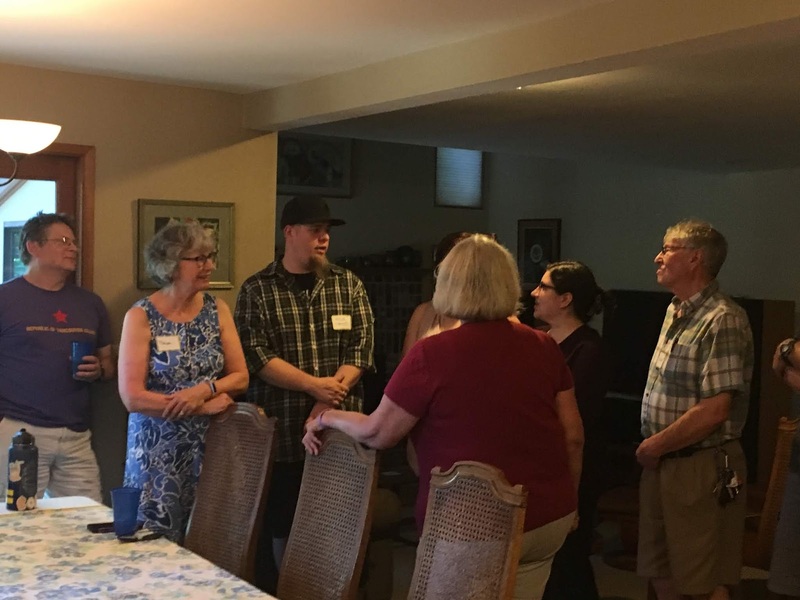 “In the state of Washington, we have made incredible progress on funding basic education,” Reykdal said.